There have been lots of stories about the unique animal in central Kenya’s Laikipia County, the location of multiple recent sightings. Nicholas Pilfold, a scientist working on the San Diego Zoo Global’s leopard conservation program in the area, says that getting any leopard on camera is a challenge. 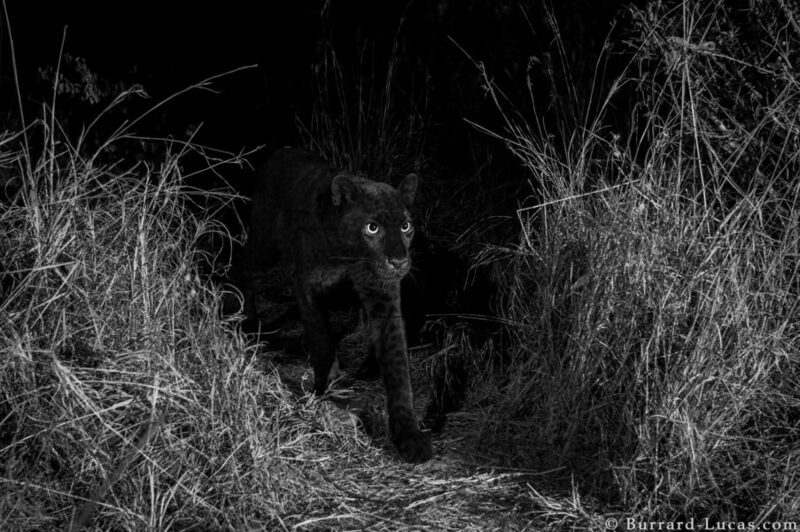 “I have never seen a high-quality image of a wild black leopard come out of Africa,” he said in a blog post, but then he heard about a sighting at Laikipia Wilderness Camp in Kenya. A local resident said she had seen one recently, and another pointed out fresh leopard tracks. Burrard-Lucas and Pilfold’s team were working separately, but they believe they captured images of the same leopard. That superhero character was from the fictional country of Wakanda. “It is interesting [because] the fictional country of Wakanda where Black Panther is set is meant to be, in the Marvel universe, in East Africa, not too far away from where we’re working,” said Pilfold. It’s worth noting that while light-coated leopards with dark spots are much more common than black leopards in this area, that’s not true everywhere. For example, the researchers noted that a different subspecies of black leopard is much more common than lighter spotted ones in certain parts of Asia.